For adults and children with dyslexia who have trouble reading, every day is a lifelong struggle. This difficulty in learning to read happens despite schooling and traditional instruction. No matter how much someone with dyslexia is exposed to reading, they can still struggle tremendously. Being dyslexic has nothing to do with mental impairment, lack of intelligence, hearing, or vision problems. Rather, it is a phenomenon that occurs when the brain is unable to translate images, letters, and words received from the eyes into meaningful language. There are two common forms of dyslexia: primary and secondary. Primary dyslexia occurs when the cerebral cortex (located in the left side of the brain) dysfunctions. This type of dyslexia remains constant throughout a person’s life and doesn’t change with age. Primary dyslexia is hereditary and shows up more often in boys. Secondary, or developmental dyslexia, is thought to be caused by hormonal development in the early stages of growth. This type of dyslexia recedes as a child grows older and is found more often in boys. Whatever the type of dyslexia, the condition can affect several different functions in the body. When someone experiences visual dyslexia, numbers and letters may be reversed and it becomes a challenge to put any of these symbols in the right order to form coherent sentences. Someone can also experience auditory dyslexia which involves difficulty with sounds of letters or groups of letters. The sounds get all mixed up and can’t be perceived correctly. Some people with dyslexia also find it difficult to hold and control a pencil or pen so that correct letter shapes can be written down. Many people with dyslexia simply give up on reading. It becomes too much of a chore to decipher words and sentences and reading becomes a tedious and uninspired exercise. For those who have primary dyslexia and have found themselves avoiding reading for most of their adult lives, e-readers may be able to help. E-readers can be programmed to display a few words per line. This helps people with dyslexia to not only read more easily, but to read with better comprehension. And being able to understand the text is a big step closer to enjoying and engaging with a story. Researchers from the Laboratory for Visual Learning at the Smithsonian Astrophysical Observatory discovered in a study that short lines improve the way a dyslexic person’s eyes scan text. This prompted the researchers to see if e-readers could be of any benefit to those with dyslexia. The research team explained that many dyslexics suffer from “visual attention deficit”—meaning they can’t concentrate on individual letters within words or words strung into long sentences. 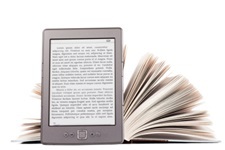 According to the researchers, using shorter lines on an e-reader can help to diminish these visual distractions within the text of a book. Over one hundred dyslexic people participated in the study and all were from a local school in Boston. The research team compared reading on paper with reading on an e-reader. They found that the e-reader significantly boosted the student’s reading speed and comprehension levels. For those suffering from adult dyslexia, this could be a simple solution to making reading accessible and meaningful. “What Causes Dyslexia?” MedicineNet web site; http://www.medicinenet.com/dyslexia/page2.htm, last accessed Sept. 26, 2013. Siassina, M., “E-readers may help people with dyslexia read easier and more quickly: study,” Vancouver Sun web site, Sept. 24, 2013; http://www.vancouversun.com/touch/health/readers+help+people+with+dyslexia+read+easier+more+quickly+study/8953151/story.html?rel=79704, last accessed Sept. 26, 2013.